This design was the last in the collection to be completed. For many reasons, it is one of my favourites in the book. 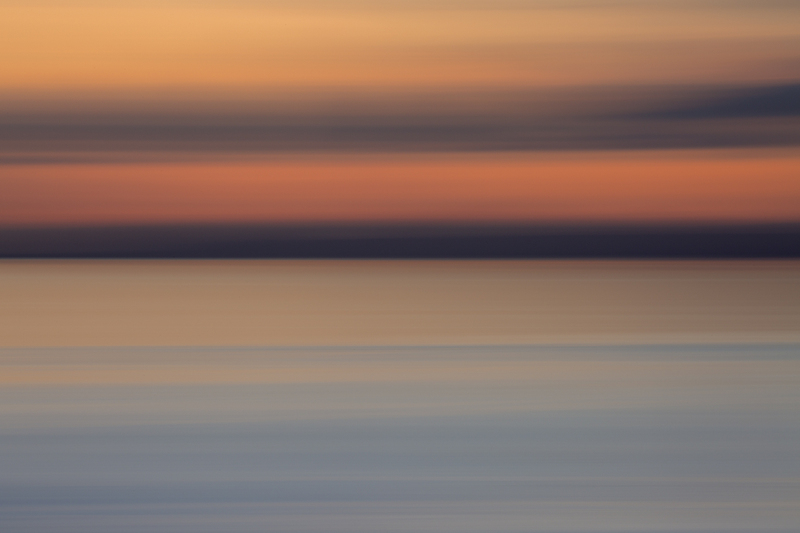 Here is some behind the scenes footage from the day that my friends at Old Scatness kindly allowed us to shoot some photographs around the site. Unfortunately, the weather wasn’t the best that day, and the photographs we managed to take in between the squally rain showers were a little grey . 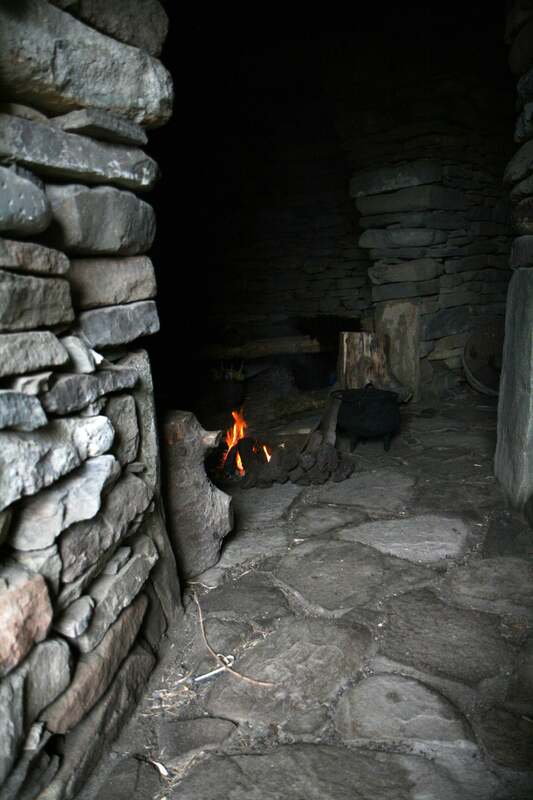 . .
. . .but there was a peat fire blazing in the reconstruction Pictish wheelhouse, which meant that we had somewhere to get dry and stay warm, just like Shetland’s early inhabitants. The following day, in typical Shetland fashion, the weather and the light were totally amazing, and we were able to get out to take these pictures. 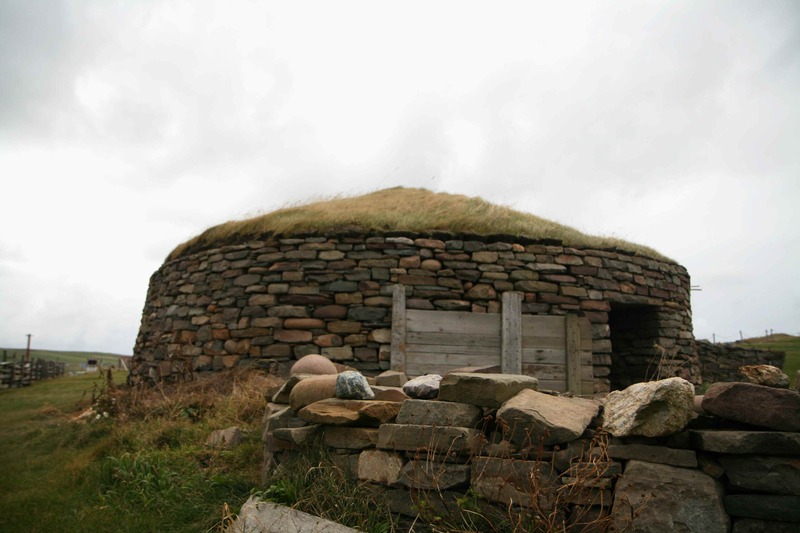 The two Scatness designs are all about circles. In the case of the tunic, this means that you knit everything in the round, cut a steek up the middle, and complete the edges with corrugated rib, icord, and neat, lined facings. 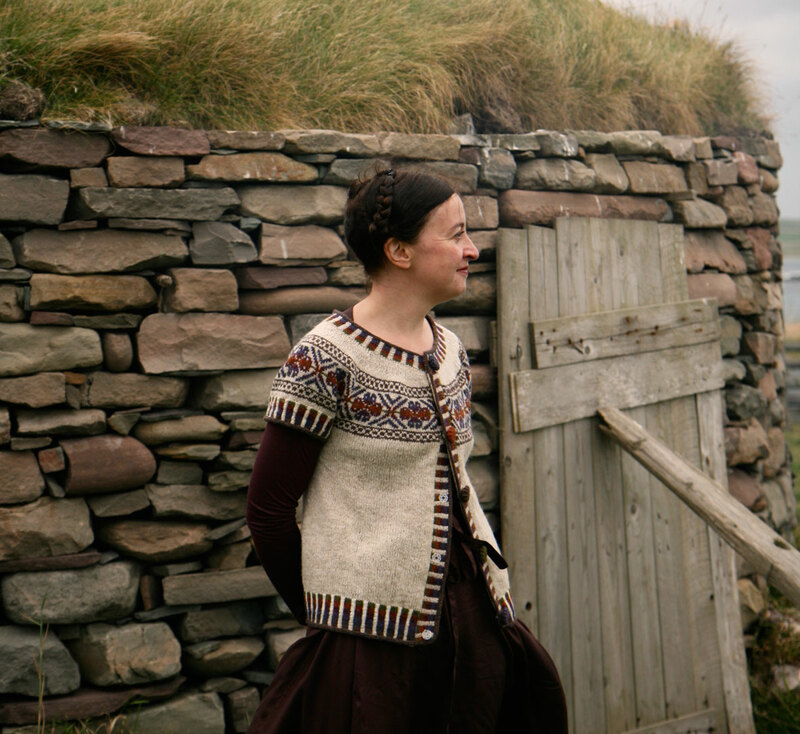 The finishing touch to the tunic is created with a set of signature wheelhouse buttons, whose colours pick up the rich shades used in the yoke and ribbing, and whose shape echoes the concentric spoked structure of the Pictish wheelhouses at Old Scatness. The book includes a tutorial to enable you to make your own wheelhouse buttons. When I was producing this part of the book, I might have got a little obsessed with making buttons . . . they are somewhat addictive. I love everything about this tunic inordinately: it is a very versatile garment, equally at home as an outdoor windcheater, or taking the chill off one’s shoulders in an air conditioned office. I love the rich autumnal hues of the yoke and the shifting colours in the rib, and for me, there is always something uniquely satisfying in the construction of a yoked garment. 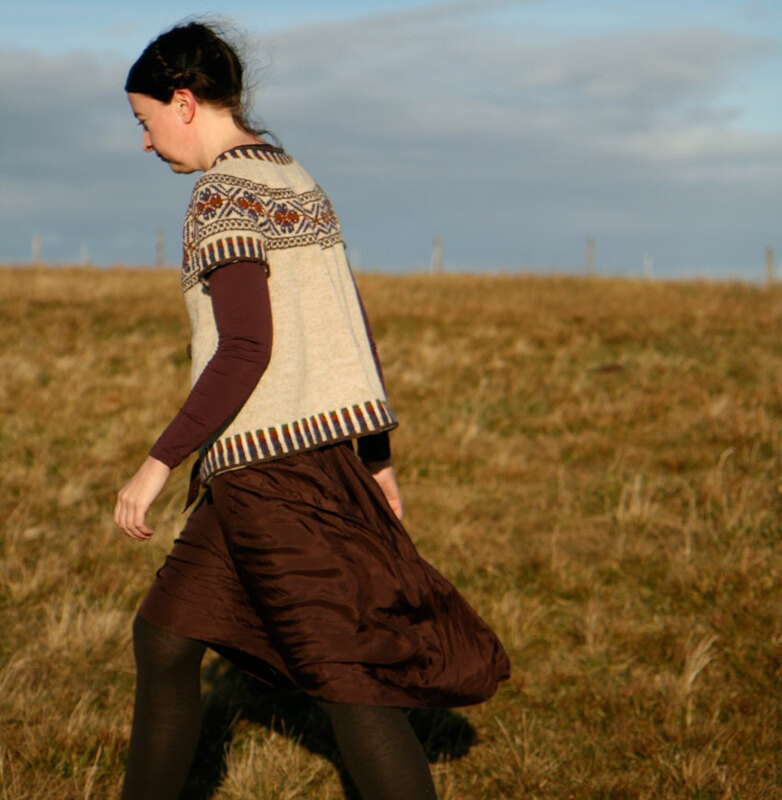 I’ve now added the Scatness Tunic it to the Colours of Shetland collection on Ravelry, and if I get my skates on, I might be able to share another design with you later today. It surely will be my favorite! Wonderful. This tunic makes me very very happy! The colours, the buttons, the whole bit, the stripey bits…! I love, love, love this tunic! And I cannot wait for the book to come available. The photos of you in the tunic are beautiful. You look Joyful! How on earth do you make these buttons? I NEED some. Buttonlust. oh my the buttons! I love this colour story, too. Kate Davies, you are genius. You are killing me with all of these MUST KNIT NOW designs. 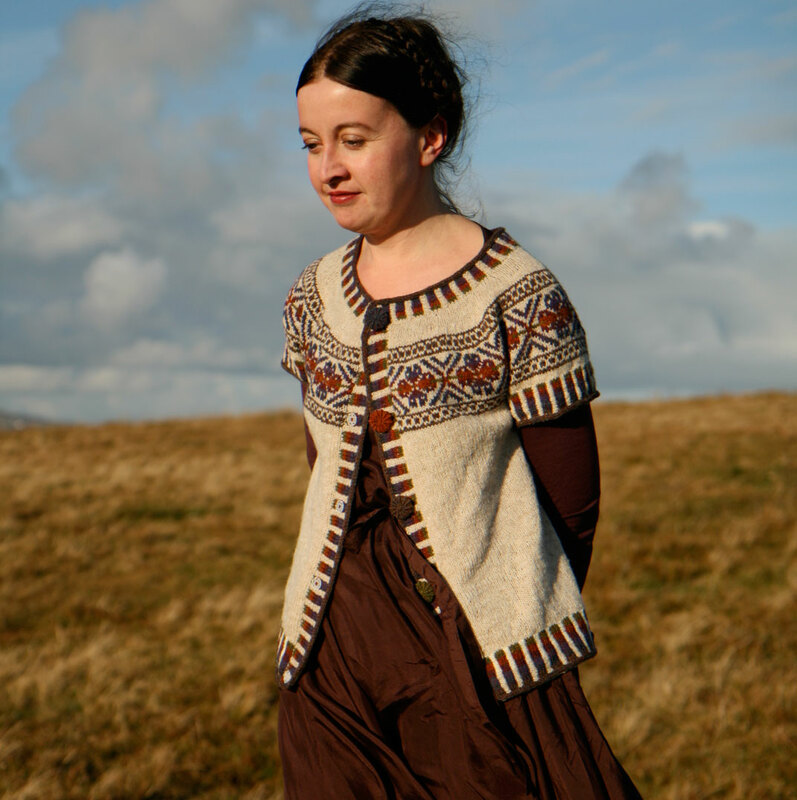 I have been completely obsessed with the Scatness Tam and now this cardi and the Northmavin Hoody. Complete genius. I cannot wait for your book to be available. Bravo. This design is way over the top. I may never knit it, but I HAVE to have it. Actually, I need what you are wearing underneath it as well(lol). What a beautiful sweater this is! And I’m always so impressed with your romantic dresses which just happen to work so well with all your lovely knitted garments. Gorgeous work. Every detail is just amazing! And the buttons! Just perfect! I love the wheelhouse buttons. They look very similar to Grindles, which are often mistaken for a Dorset button. I’m a little obsessed with buttons as well. I started a shop so I could make them. Just love this Kate, the colours, the binding for the steeks (what is it and where can I get it? ), the buttons, the short-sleeves … Everything about it. Clever girl that you are. 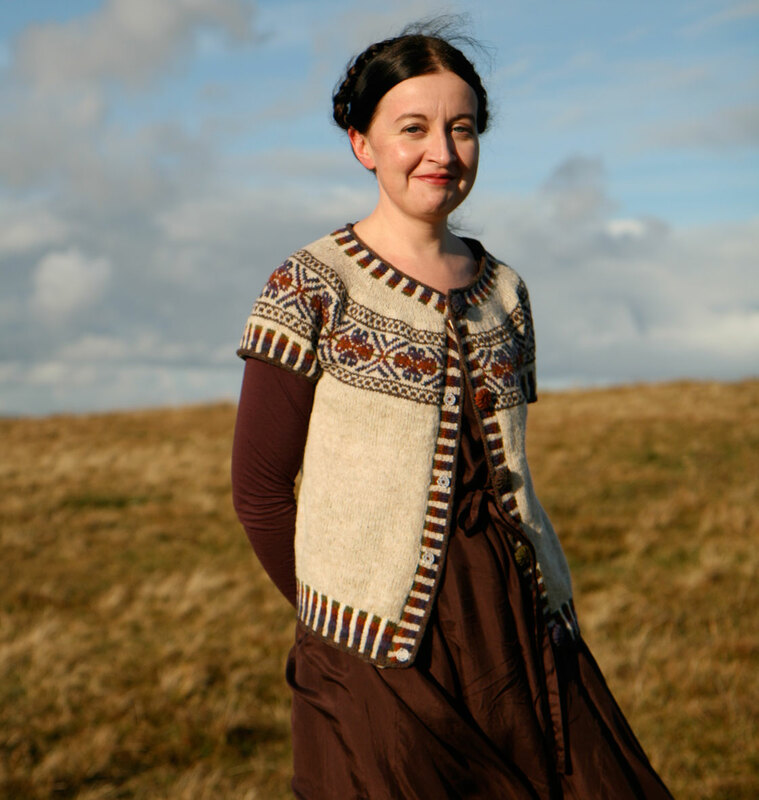 I love the scatness tunic, and I have to ask, where did you get that beautiful brown (silk?) dress? 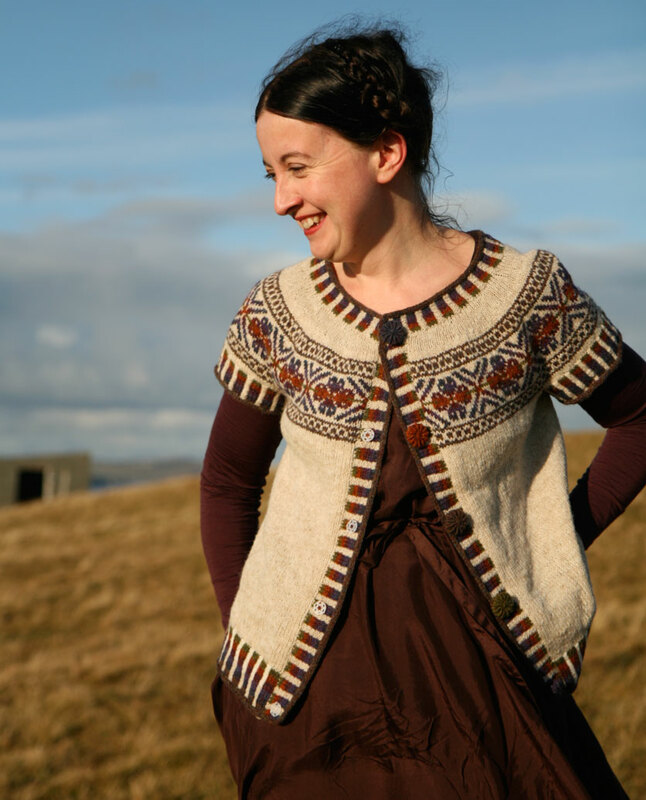 Colours of Shetland is going to be the book of my dreams. 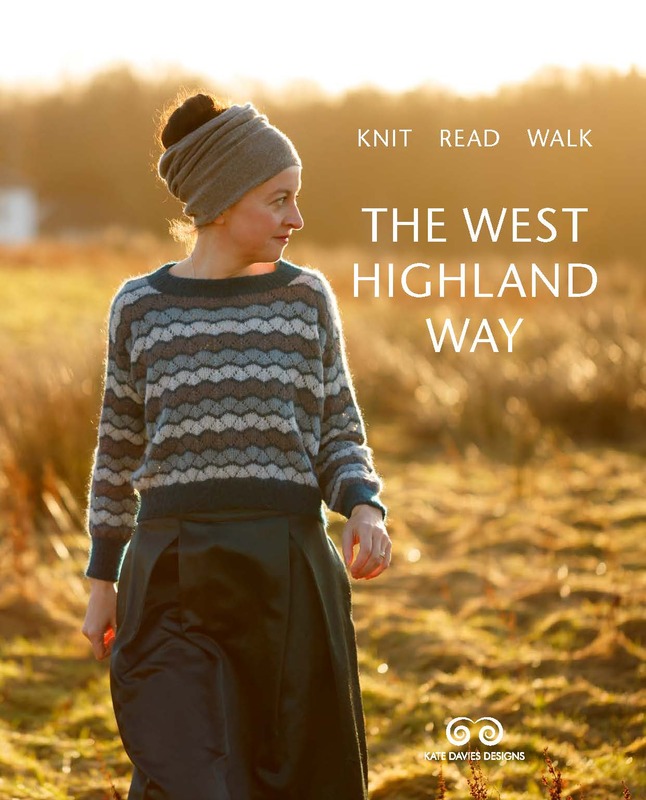 Each design you share increase the anticipation to have your lovely book….It seems like 2013 is going to need to be a year of knitting the Colours of Shetland….. I am so excited. Can’t wait for the book to come out. Then it will be which design do I knit first …..? Oh! Can I please ask you about the pretty ribbon you used? Oh….dear Kate…you’re creativity never ceases to amaze me! I LOVE the buttons!! Can’t wait to make them…I know I can get more made with my 8 year old girlie! What a beautiful design and the photo shoot is fantastic as well. You have paired the tunic very nicely with your rich chocolate outfit underneath. I love your designs for your new book! I really like all of your designs! really!! and I have knit quite a few of them, but lately, I seem to have fallen down the rabbit hole of luxury yarn. I do want to get back to using good wool. Your new book will lead the way for me. I have two small daughters that I have trained from birth to wear wool – you know – start with the softest baby wool and increase the dosage, but they are still on mostly merinos and bfl. 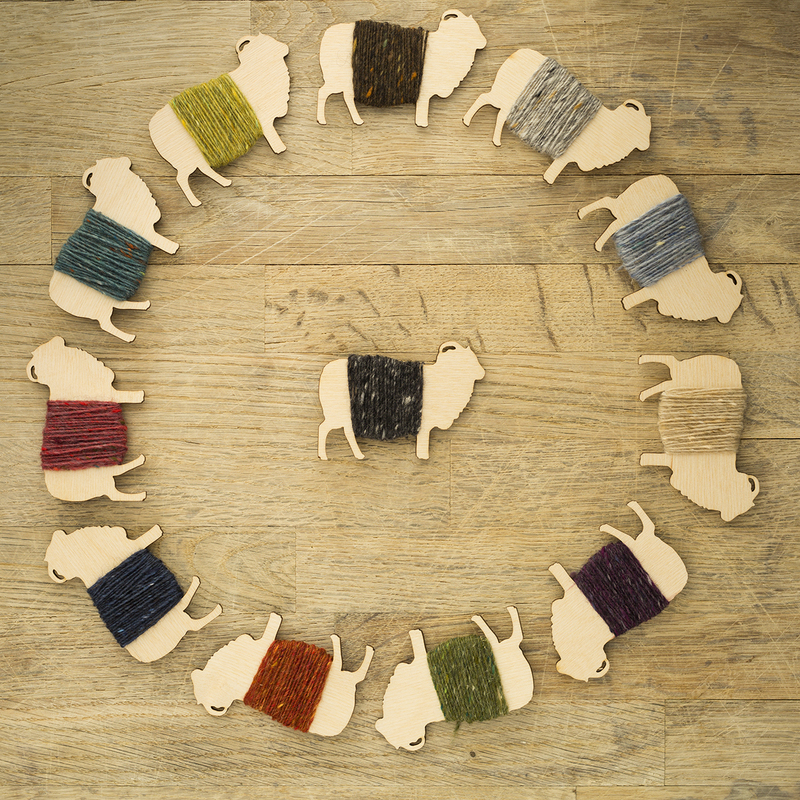 I am looking forward to the colour stories and mulling over the colour possibilities of Shetland wool with you. i haven’t done any fair isle knitting for over ten years. that will have to change! both the tam and the tunic are an enticing preview. looking forward to perusing your book. It is just getting better and better and better. Chapeau! I can’t help repeating what everyone else has said – oh, the buttons. Really lovely work all round. I’m looking forward to the book. Love the choice of colors which match the hat. Also love the combining of flowers and stripes. I don’t know why but I am so drawn to stripes. I understand why this is a favorite of yours. An heirloom piece, for sure. I love the buttons!!! Phenomenal work. Ohmygoodness, that design makes me happy! I cannot wait to see more and have my own copy of the book! Beautiful, and so are you! Absolutely lovely! The buttons did me in–it’s now on my calendar to order the book on December 3! Oh, I was laughing with excitement, each picture was better than the last! One thought was……….OH the BUTTONS, where will I ever get buttons like that and then, BINGO, you came to our rescue once again! I have made buttons for garments and had forgotten all about it. what a treasure of a tunic! And the weather? Same as I remember, lovely in all it’s incantations:) Good on you!!! Kate, you look like you’ve come right out of the Iron Age. And I mean that in the best possible way. 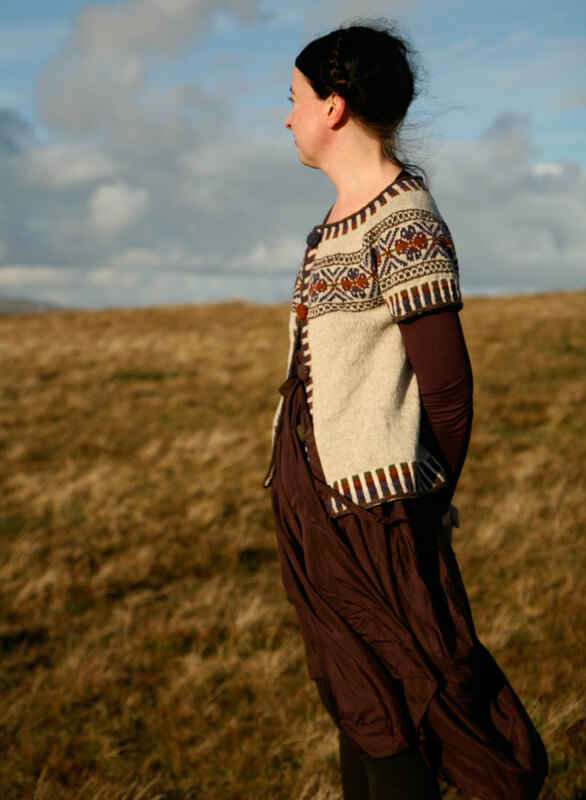 the colors of this wool, and the effect of the tunic over the cinnamon-colored flowy silk dress are especially fetching, as are the motifs in both scatness tam and tunic. the wheelhouse buttons are to die for. i think this may be….your finest design so far. (facing on tunic!!! oh so pretty!!!) how very exciting. oh my…your designs are simply amazing Kate…I especially love this one and those buttons!!! Oh no – it’s all too much! 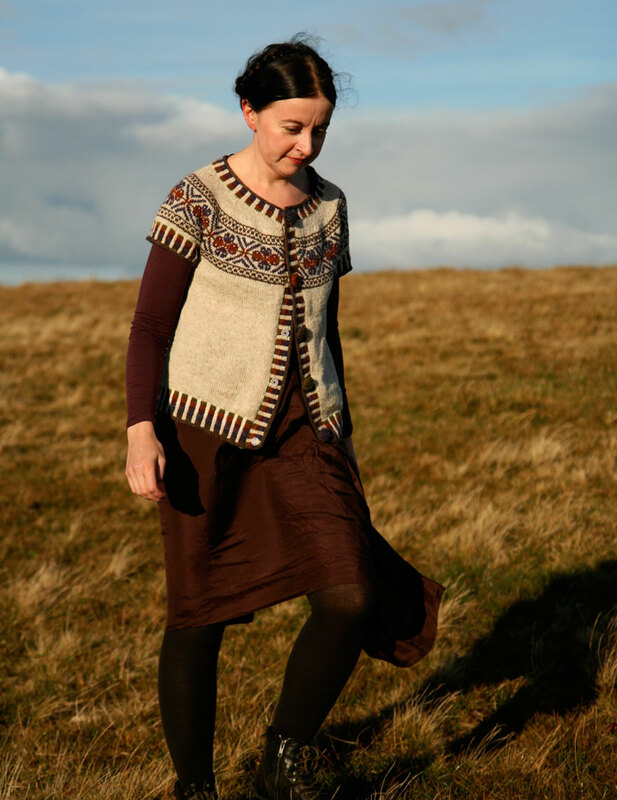 I had already decided that when my rams and yowes blanket is finished I’d move straight to the northmavine hooded cardi … then I had to make mental space for the scatness tam … now I need to squeeze in the scatness tunic. You’ve got me stitched up for the next year at least. Every time you post a design I am more and more in awe of your artistry. The colours and shapes are so exciting! I love this tunic. I can see it on me, and working into my lifestyle. Your designs are very wearable. I love them. Just darling! I’m a scaredy cat when it comes to steeking, though. Guess I’ll need to visit Anne of Milton, one of your frequent commenters. Oh, Anne . . . .
No problem Candice…..I’ll get you through your first steek experience…..
Kate – what a fabulous design…..can’t wait. Anne, I’m in London, ON, Canada. Great to have a couple of ON’s who follow Kate. Kate, you make my day and though my hands are not able to knit very much, I look forward to you book and the (almost) daily e-mails. Keep them coming…..
Oh, my…….oh, my………oh, my. I can see my queue for 2013 is going to have to be totally readjusted. We’re in for a real treat aren’t we! I am terribly excited for December 3rd. Congratulations, Kate, on the stunning results of your hard work! wow, wow, wow! this is almost too exciting. Absolutely love your beautiful designs and photographs. Wow – beautiful! I must visit Old Scatness! Oh. My. Goodness. Such beauty Kate, you, the tunic and the scenery is magical!! Absolutely wonderful. I can’t wait to order the book an December 3rd. And I do have a question: Can you pay the book via paypal or only by credit card? ooh.. you are a temptress! I’m so looking forward to seeing all these amazing designs pulled together in a real book! Love the colours in this, and the buttons. So very excited for you as we head into December. Stunning design. As always your creativity and attention to detail win the day. Beautiful work!